Paige & Emerson ~ One Year Old! What a happy little girl! Eva was all smiles at her one year old portrait session. She’s here! Beautiful. Precious. Loved. 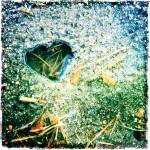 Love this heart shaped hole in our driveway! I know it’s just a random act of rain, wind, heat and cold but I think it’s special all the same.